The winner of this category will be determined through expert assessment by Nikon jurors. The winner of this category will be determined through public voting on our Facebook page i.e. likes + shares. - Netizens get to vote for their favorite entries via likes and shares. The entry that receives the most likes and shares by the 30th November 2017, at precisely 12PM UAE time, will be declared the People’s Choice. • This contest is open to NIKON USERS ONLY, who are currently residing in countries within Middle East and Africa, and Pakistan and Nepal. Participants who are discovered to be residing outside of this demographic will be disqualified. • To participate, send your best wildlife photos to us via private message on Facebook . Please make sure to include the technical specifications, as well as your contact details. Contestants whose entries pass the initial screening will be asked to submit the high resolution photos via email. IMPORTANT NOTE: Contestants who fail to submit high resolution photos will be disqualified. 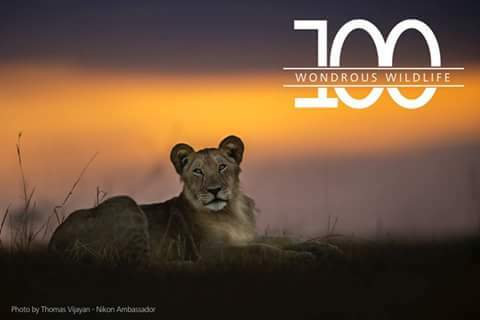 • You may also submit via Instagram by using the hashtag #Nikon100Wildlife. Contestants whose entries pass the initial screening will be contacted via DM. • You may submit up to 3 photos, maximum. You must use a Nikon camera to take the photo. Post processing is allowed but should be kept to a minimum. You may put a watermark on your photo but please make sure that it does not distract from the essence of the image. • “Wildlife” only applies to photos of animals taken in their natural habitat or in nature reserves. Photos of domesticated animals (e.g. cats, dogs, domesticated horses etc.) or animals in enclosures (zoo animals, fish or aquatic mammals in aquariums etc.) will not be considered. Photo may be new or from your archive. • This contest is being organized by Nikon ME FZE and is in no way sponsored, endorsed or administered by, or associated with Facebook. • Photographers should be mindful of country laws when taking photographs. Nikon ME FZE will not assume any liability resulting from inappropriate photography practices. •Photographers should be responsible for obtaining all model releases and needful permits pertinent to the photograph. Nikon ME FZE will not be held responsible for any issues concerning model releases and usage rights. • Nikon ME FZE reserves the right to disqualify entries that do not meet quality standards, or those that may be deemed inappropriate or offensive. • Nikon ME FZE reserves the right to terminate the Contest at any time without prior notice. Nikon ME FZE shall not be liable for any loss, damage or expense as a result. • Nikon ME FZE reserves the right to change, amend, delete or add to these Contest Terms and Conditions without prior notice at any time. Participants agree to be bound to any such changes. • Nikon ME FZE decision shall be final and binding. No correspondence shall be entertained. • Nikon ME FZE reserves the right to share the photos submitted for this contest on all of Nikon Middle East and Nikon Africa social media platforms, with full credits and attributions to the photographers. These platforms include but are not limited to the Nikon Middle East Facebook page, the Nikon Africa Facebook page, and the Nikon MEA Instagram page. NOTE: By participating in this Contest, you agree to comply with these terms and conditions.